The Ohio-Kentucky-Indiana Regional Council of Governments (OKI) has been working to adapt and produce a transportation plan that would affect the Cincinnati area for the next 30 years. 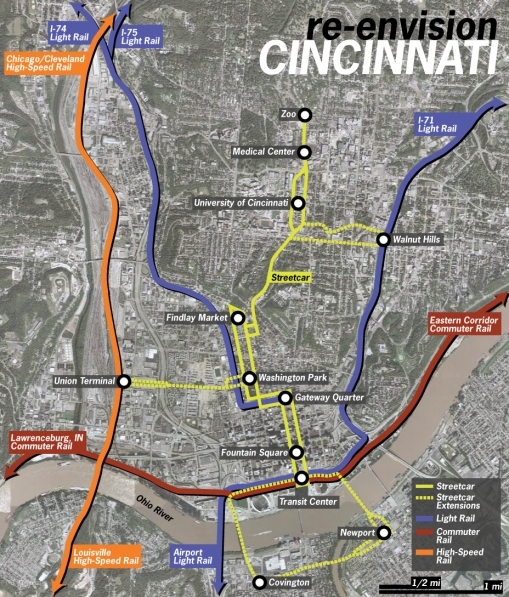 The regional council released a presentation in August outlining the goals and plans meant to address Greater Cincinnati’s current and projected transportation needs. Citing objectives like mobility, environment, economic vitality and efficiency, the presentation describes OKI’s projections for both population and job growth in the future, and hints at how the council plans to address the region’s transit needs. According to OKI’s projections, the regional population is expected to grow from 1.9 million (in 2005) to nearly 2.4 million people in 2040. Every county is expected to grow in population and job creation. With these numbers in mind, the council has planned, or is carrying out, a total of 33 highway projects and six transit projects, which include bus purchases, park and ride facilities, transit centers and the Cincinnati Streetcar project. According to OKI, transit currently accounts for approximately two percent of trips taken throughout the region. Whether lack of ridership is due to an inadequate and struggling system remains to be seen, but for whatever reason, OKI appears to be putting the majority of their focus for the future into highway maintenance and construction, with multi-modal transportation options as an afterthought. OKI leadership expressed concern, to UrbanCincy, about the potentially harmful effects of Issue 48 (the anti-rail amendment on the ballot this election) could have on future systems. If an effective, regional commuter rail and transit system is something you would like to see in Cincinnati by 2040, please speak up and let the OKI Regional Council of Governments know. There are three community open houses coming up – one of them is today, September 15, at the Crestview Hills City Building (map) from 4pm to 7pm. The other two meetings will take place September 27 at Xavier University’s Cintas Center (map), and September 28 at Butler County’s Government Services Building (map). Today also marks the official kickoff of the No on Issue 48 Campaign. Cincinnatians for Progress is looking for volunteers to help get the word out about this damaging amendment to the City’s Charter. Sign up here. Your voice makes a difference. Speak up for Cincinnati and let it be heard.